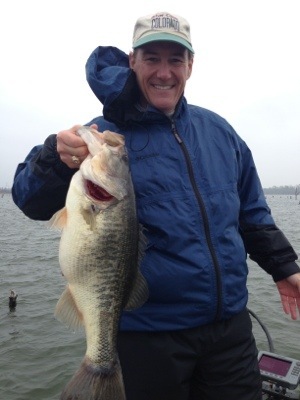 March is here, and the fishing on Lake Fork continues to get better. Lake Fork is currently 2.06 ft belown normal pool, and the water temps in the back of the creeks and pockets are in the 61-65 degree range. Water clarity ranges from muddy in the far upper ends to fairly clear as you get closer to the dam. We had a little bit of an up and down week. 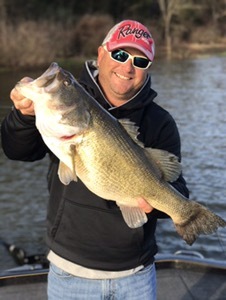 Yesterday was our best day for numbers with 15 bass in the boat, and our big fish of the week came on Wednesday with a beautiful, fat female weighing 8.31 lbs. 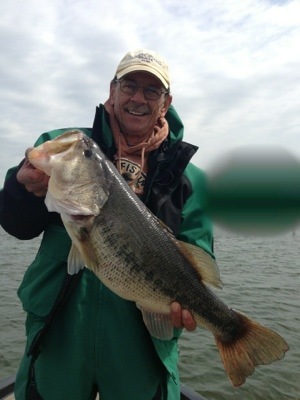 Our best producer has been a white bladed jig with a 3.5″ LFT Live Magic Shad as a trailer. I have said it before and I’ll continue to say it. 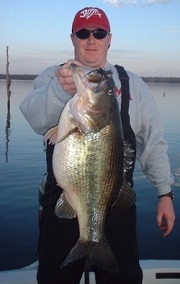 If you are not using the Live Magic Shad on the back of your chatterbait, you are costing yourself some fish. We are fishing this bait from the bank out to about 4 feet of water. Thoroughly fishing the available cover is key, and we are catching fish around both wood and vegetation. The other pattern that is working well for us is a drop shot using a 5″ Strike King KVD Finesse Worm. Green Pumpkin and Junebug are both very good produces. We are pitching stumps in 2-12 ft of water. Bites are very subtle, so work the bait slowly and pay close attention to what your bait is doing. I hope that helps you on your next trip to Lake Fork. These are also great techniques to try on you home lake!!! Be sure to follow me on Facebook and Instagram where I will post pics of our catches. With the warmer weather, our water temperatures have been on the rise. 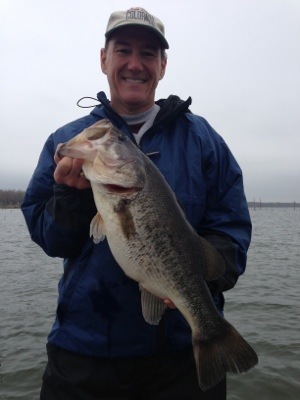 This week, I found water as warm as 58.5 degrees, and most of the areas we fished were over 56 degrees. The warmer temps pulled a lot of big females onto the flats and secondary points where we were able to cover some water and catch them a little more easily. Water level as of this writing is 398.89 (4.11 ft below full pool), but it is slowly on the rise with the rain that we are receiving as I write. Our best bait has been a red lipless crankbait, but you should also try a Santone spinnerbait, a Chatterbait with LFT Live Magic Shad, and a jerkbait in the same areas. Many times, we will go through an area a couple of times with the lipless crankbait, and go back through it with another bait and pick up another fish or two. You want to be very thorough when covering water as a bass’s strike zone is fairly small in this cool water. Almost all of our fish are coming from less than 3 feet of water, and if you can find some hydrilla or coontail, you will likely find some fish. The weather forecast for the coming week shows highs in the mid-50s and lows in the low 30s. This will bring the water temps back down into the low 50s, and maybe even the upper 40s. When this happens, it’s time to pick up your Black/Blue, Camo, or Sloppy Joe colored Santone Jig, move out to the creek channels, and go to work. When the water temps fall, I normally have better success using a LFT Flipper for my jig trailer, but when water temps are on the rise, I tend to opt more for the bigger LFT Hyper Freak. The Flipper is a little more subtle in it’s action than the Hyper Freak, and sometimes, that makes all the difference when these fish are finicky. You want to split the tail on the Flipper as it is designed with “rudders” that force the tail to spread out when it’s moved, making it look a lot like a crawfish. I will work the standing timber along the banks of the creek channels in about 5-15 ft of water. When you catch one, pay attention to the fish’s depth. If you catch one in 8 ft of water, and another in 12 ft of water, but nothing shallower and nothing deeper, you can probably save yourself a lot of time by concentrating your efforts in that depth range when you move to the next creek. I hope that helps you on your next trip to Lake Fork. If you have any questions, please let me know! 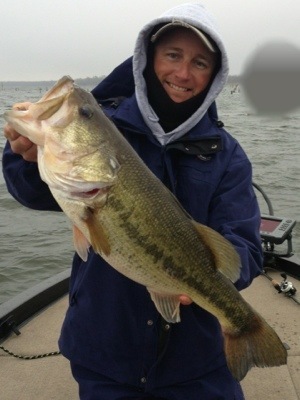 Lake Fork is still turning over, and the fishing remains tough (for the most part). The best bite seems to be shallow, and if you can find some submerged vegetation, you will find some fish. The lake is sitting at 399.36 or 3.64 ft below normal pool. Water temps have been in the mid-80s, but those will continue to fall with the cooler weather and shorter days. With the end of the turnover and the cooler water temps, the fishing will pick up. Look for shad in the backs of pockets just off of the main lake and in the backs of major creeks as the month progresses. 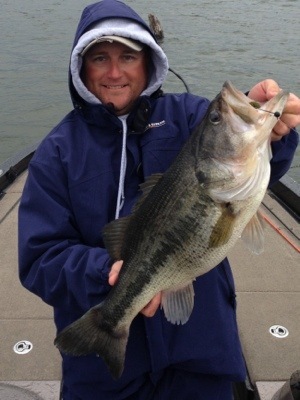 Just about any bait will work when these fish are actively feeding, but some of my favorites are a Santone Get Five spinnerbait, a Chatterbait with 3.5″ Lake Fork Trophy Lures Live Magic Shad, a squarebill crankbait, a lipless crankbait, and a frog. The McDonald’s Big Bass Splash is coming up September 21-23, so the lake will be jam packed for that. If you don’t have a room yet, I hear that there are a few rooms at some of the hotels in Sulphur Springs. From what I understand, there is nothing available around the lake. Best of luck to all of those competing in the coming weeks. 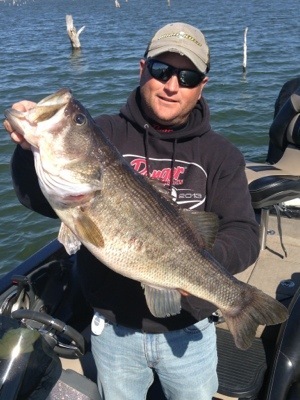 October looks to be a great month to get out on Lake Fork. It is historically one of my favorite months to fish Lake Fork. If you’re looking for a guide, please give me a shout. The deep bite continues to produce good fish for us. The last couple of days, we have caught fish a deep as 29 ft of water on Santone Football jigs, drop shots, swimbaits, umbrella rigs, and heavy spinnerbaits with a 5.5″ LFT Live Magic Shad Swimbait. The bite is definitely picking up as a big number of fish have made the move to ultra shallow water since noon yesterday. Water temp on the main lake was 59 and we found water as warm as 67 in the back of a creek and the fish were bunched up back there. We caught a bunch of fish today on a white 3/8 oz chatterbait with a LFT Live Magic Shad in Albino Shad color. 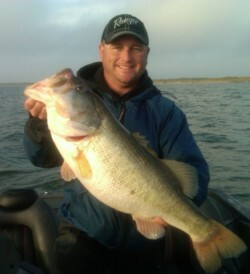 We also caught a bunch of fish on a Junebug colored Texas rigged LFT Flipper. Most of our fish came from less than 3 ft of water. The bite seems to be improving with our current warming trend. Water temp on the main lake when we started this morning was 54 degrees and by mid-afternoon, we found water as warm as 62 degrees. Secondary points produced best for us today as we boated 13 and lost several. Many fish were slapping at the bait and not eating it. Chatterbaits trailed with an LFT Live Magic Shad accounted for our better fish today, but we caught a few on squarebill and lipless crankbaits in crawfish patterns.